The Harry Potter series has been a big part of my life for most of this decade. We started out reading the books together when my son was young, and as each new book came out we read it together, sharing the excitement, the humor, the tragedies and the surprises. I've been a lifelong reader of fantasy, and yet something about Harry Potter was, and is, special. When Harry Potter and the Deathly Hallows was first released, we got the book at midnight, as many other people did. Although we could have finished it more quickly if we each read it ourselves, we opted to read the last book together and savor it, as we had the rest of the journey. We read almost straight through over the next couple of days, avoiding even going out of the house if possible, to avoid spoilers. After it was over, I had a powerful emotional reaction that lasted for days: a response to the powerful story itself, combined with a sense of loss that the series was ended. 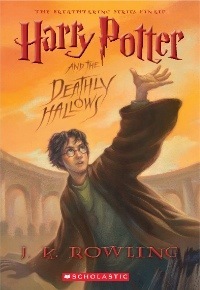 Book 7 Harry Potter and the Deathly Hallows! To enter, write about a Harry Potter memory in the comments, between now and the end of the day July 6. It could be a great release party you attended, how you discovered the series, a special place that you read one of the books, what the series means to you, or anything else relating to Harry Potter and your life. It could just be as simple as your favorite Harry Potter book. The winner will be randomly selected on July 7. (So if you don't win, you can head on over to the bookstore and buy your own paperback copy). We can only ship the prizes to U.S. addresses only. You can also get extra entries by blogging or tweeting about the giveaway. Please include the hashtag #wawhp in your tweets, and post a link to blog entries in the comments below. Harry Potter and the Deathly Hallows is a breathtaking finish to a remarkable series. The final chapter to Harry Potter’s adventures will be released in paperback July 7th! It all comes down to this - a final face off between good and evil. You plan to pull out all the stops, but every time you solve one mystery, three more evolve. The Harry Potter audio books have kept me good company on my long commute to work. Jim Dale is an incredible talent, if you've never heard him do the voices, give them a listen! Prisoner of Azkaban has got to be one of my favorites. I started reading HP when I had suffered through a very emotionally scaring part of my life, where i turned to drinking, taking pills and buring myself to make the pain go away. I had gotten the first 4 books as a gift from my aunt, who is a 4th grade teacher. Then I was in McDonalds and saw a lady in her later years with her equally aged friend discussing in excitement the new release (OOtP)..and I thought, there women are getting so happy from it, I could try it. I went home to my studio apartment, and instead of drinking, I decided to read book 1. Later that week I was already starting on POA. I read the series over and over and over. It helped my mind escape the hurt and began to heal over with this new found obsession. Later in life, I covered the scars from the burns on my arm with a Dementor tattoo..to remind me of how once my being was being taken from me this way, and how much of an impact Harry Potter had on my life. The tattoo covers the scars, and reminds me that there is something to cure the hurt always. I have these books of course...I just thought this is a great place to share my story. Thanks for reading. I would love to win the prize.Right now i am on Harry Potter and the order of the Phoenix.I hope you consider me on winning. I remember taking my son and his friends for his birthday sleepover to the Harry Potter movie, and then they came home to sleep here after a pizza dinner. My goodness, what fun they had discussing the movie! my favorite harry potter memory is the simmer the first book came out. i and my daughter would lay out in the hammock in our back yard and i would read to her. her love of books started right there. I first fell in love with this series when the first book came out many years ago. My son was then 7 years old. He had glasses and looked a bit like Harry Potter to be quite honest. When the next book came out and it was so huge I have the cutest picture of my eight year old boy with a book that looks bigger than he is sitting at our dinner table reading it. I now have another child my daughter that is so in love with this series and is already planning on being Hermoine for Halloween! I would love to be entered. I've been reading Harry Potter for basically ten years now and it's been a huge part of my life. I used to read fan fiction all the time even (and still do every now and then) and I must admit, I used to write some (though never online) and I still have some of the notebooks with the stores. It's fun to go back and see everything that I've done. Thanks to everyone for sharing your memories. I'm quite moved to read all of these. I wanted to clarify that you don't have to include your email in your comment if you don't want to; just be sure to check back here after July 7 and I'll post the winners and ask you to send me your contact information privately. I'll never forget sitting in the line at my local Barnes & Noble at a quarter to midnight as a strange green firework shot across the sky above us and wormed its way into the shape of the dark mark. The hushed, startled silence of the crowd and then the wild, exultant cheers we erupted into at the sheer magic of it all. I'll never forget sitting next to my husband at 12:30am and turning to the dedication page to find out she'd dedicated the last one to us. "And to You, if you have stuck with Harry until the very end." To me, it was a profoundly touching moment between an author and her readers. And I will never forget my 32-year-old brother-in-law tiptoeing in at the point of no return, whispering excitedly, "Where are you guys?" then climbing onto the bed with us, and the three of us reading it to the end together. It was the most amazingly satisfying reading experience I can imagine. More than I'd hoped for. To this day, nothing else compares. What can I say about good ol' Harry? Well, for a long time I resisted reading the books even though everyone told me I just HAD to read them. My favorite books were the Lord of the Rings trilogy and I thought Harry Potter was just a silly children's book and couldn't possibly compete with REAL fantasy. Anyway, long story short, I finally picked up the books for a serious read when I figured out that I was going to be teaching 5th grade and should probably start reading YA fiction. Now I can admit my folly and honestly say what a big fan I am of Mr. Harry and all his adventures. Reading the Harry Potter series is like visiting with an old dear friend. You feel like you know them all and it's so fun to read again and again. My favorite book would have to be the Sorcerer's Stone just because that was my first trip into Hogwarts and I'll always treasure it. My favorite Harry Potter memory is actually related to the movie. I'm in graduate school, and Harry is extremely popular with my fellow history majors. When the first movie came out, we arranged to go see it in a group and it was awesome---people I'd never socialized with before came along. It was the biggest group of history grad students I'd seen outside of the departmental parties, and I think we must have had a whole row to ourselves! Also awesome was when the Bryn Mawr Classical Review reviewed Harry Potter in Ancient Greek. (The book was in Greek, not the review). For the longest time, my son had been after me to sit down and watch the first Harry Potter movie with him. I kept putting it off, and putting it off, not thinking it was something I would like at all (even though we watch a lot of movies together, this was one I simply had no interest in). My favorite Harry Potter moment was the last movie. A group of us went to the midnight showing and it was so much fun. I love HP! I was in Wal-mart the day that the 6th book came out. This little boy grabed a copy of the book and then turned to look at his Mom with this look on his face that just said I dare you to say I can't have it. Instead she asked him if that was the one he wanted and he nooded his head. It was so sweet. I thought I'd entered, but don't see my name in the comments soo.... oh, well. My best HP memory, though I have so many, has to be waiting in the midnight lines with my youngest son (who just graduated college). We would fight over who got to read it first (he always won). We'll be in another midnight line in July when we watch HP 6 on film. Luckily, he didn't grow too old for book love. Hi Tasses. I don't remember seeing your entry in the pending queue, but I apologize if I somehow messed up approving it. It wouldn't be the first time. Thanks for entering again, and good luck! Thanks for blogging it, Rachel! That gets you another entry. Good luck! I love the harry potter series too! I have re-read my hard cover set so much it is starting to fall apart. I cannot wait for the next movie to come out!! My favorite book still is the 4th one. I first heard about the series around the time Prisoner of Azkaban was released in the U.S. All I knew about it was that they were children's books and huge bestsellers. I bought the first one and remember not leaving my kitchen table until I was done reading it. Then it was torture waiting for Books 2 and 3.... there were huge waiting lists at the library. My boyfriend (now my husband) bought the hardcover copies for me a present. Harry's had an important place in my life ever since. I had never watched the movies or read the books so one day 3 of them were on tv one after another so my daughter and I made a day of watching Harry Potter! When I was in library school, I worked hard all week long (and I had a part-time job too). It was tough. But on Sundays I did no work at all! Often I would ride my bike 7 miles to the beach, find a place to relax, and read Harry Potter all afternoon! (Sorry, library, for returning sandy books! Yes, I should have known better!) The books were fun and being near the ocean always seemed to put my school stress in perspective. I remember taking my daughter to a Harry Potter event at a book store and it was such fun. Everybody was excited and happy and there were a lot of activities for the kids. It was a fun family evening. I read the first book when I was in college as part of a Children's Lit class. I remember that I started it in the evening, and kept reading straight through the night to finish it, because I couldn't put it down! When I was engaged to my husband, he saved up and bought me a replica of Hermione's time-turner pendant for Christmas. That meant a lot to me not only because he'd saved to get me something beautiful, but also because he was accepting me for the huge geek I truly am. It was very romantic :). Thanks, Harry Potter for that moment! Harry Potter memory? Well, the first time I ever got into the stuff was when my sister and grandpa made me see the movie. That's something I'll always have as a connection to both of them. Warm and snuggly, right? I own a collection of hardbound first editions acquired individually one after the other following furious and often painful intervals between publishing's over the course of a decade. Each interval wasn't anxiety wrought the entire time, just exacerbated immediately following the reading of the most recently released copy and just preceding a brand new release. As consequence there is literally NO WAY these books will ever be removed from their shelf to be place into the hands of my 11 and 7 year old nieces. Who have been after me for as long as the first movie hit the theaters. I've held them off in the past by purchasing BookCD's of the first four books which they really enjoyed but my bank account didn't. Obtaining soft covers at no price to myself would solve the impasse in which the children and I find ourselves. They will get to finger Harry Potter to their little pink hearts content and both my collection and afore mentioned bank account remain unmolested. I remember the anticipation for Deathly Hollows! I couldn't wait to read it and when it arrived from amazon, I didn't answer any phone calls and read the whole thing in one day! I have only watched Harry Potter at the movies. I would love to read the books though. I know that I should read the books first, but that never seems to happen. Thank you for offering these great reads. 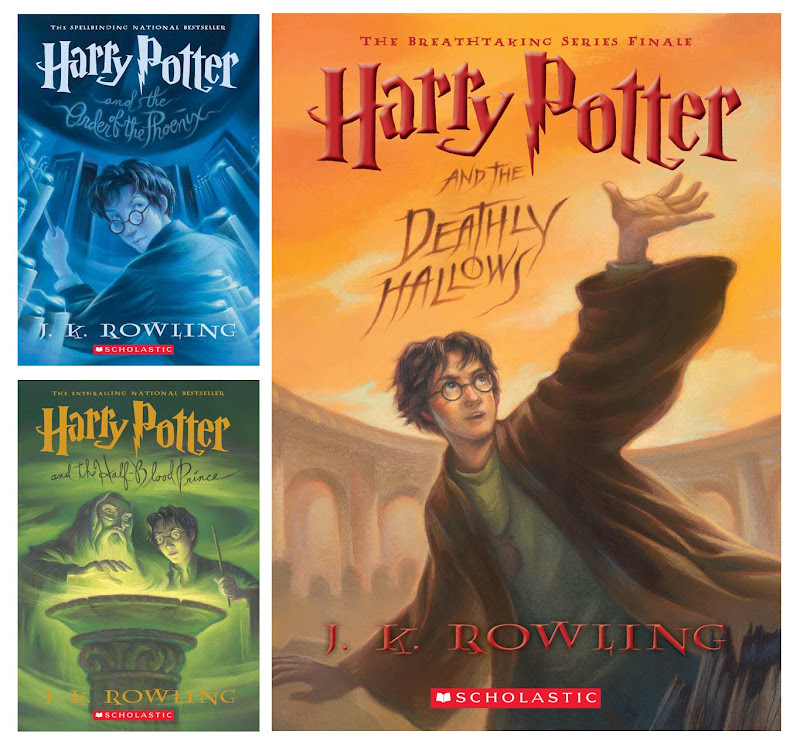 My husband and I read all the books as soon as they came out, and the most exciting thing for me has been watching my now 8-year-old son discover Harry Potter and start reading them on his own. This year during second grade he read his way through the first 4 books -- and he has just as big a crush on the Harry Potter series as I do! It would be great to win books 5-7 in paperback so he could have them for his very own library. I admit I'm quite possessive of my hardback copies! 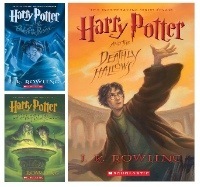 I do not have these books in the Harry Potter series and would love to get back into reading them. I read the first one as soon as it came out and enjoyed it. My son was young and hated reading at the time but wanted to know what was happening. "Tell me, what they're doing now." He couldn't wait for the movie. Now he's older and has a fondness for reading and has been going back to the first books to read them. I started reading the series when I was in 7th grade and loved them. I still remember my sister and I getting the 3rd book and reading the whole book in 2 days. We just sat on our beds the whole weekend and read. Prisoner of Azkaban is still my favorite. My favorite thing about Harry Potter is a bit outside the books. I'm just amazed and inspired by all that J.P. Rowling has been able to do! From single motherhood, to becoming the most successful author on the planet, she's really an inspiration to us all! I think my favorite Harry Potter memory is my daughter's 5th birthday. We threw a Harry Potter bash. We had a sorting hat sort the kids as they arrived, they made their wands, brewed potions, pulled figures out of a box for transfiguration, took their OWLS (Harry Potter Scene It) and just had a really wonderful time. Even the parents who stayed got into it with us. I got the first Harry Potter book for Christmas in 1998, and I've been hooked ever since! My Son began reading HP and begged me to read it, he has great taste and the rest is history in our family. My son has read the series five or six times, My daughter has read the series two or three times & I have read it three times! Thanks so much to everyone who entered! I'm amazed at the memories shared and at how much Harry Potter has meant to so many people. Thank you for sharing your Harry Potter memories with me.